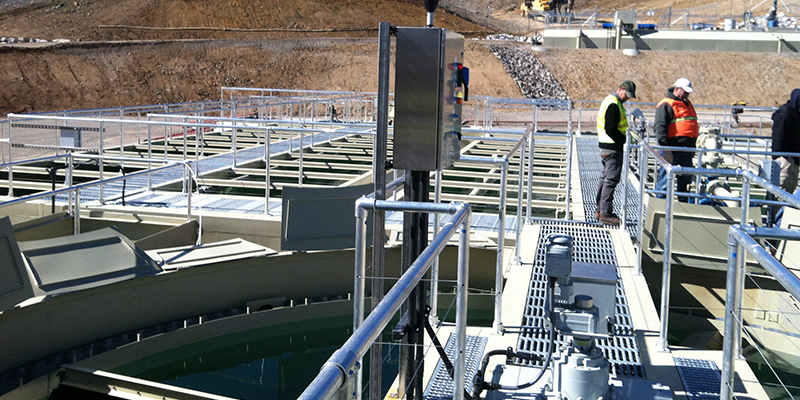 The final plant design included a customized, modular tank arrangement for aeration and to hold sludge. The equalization tank was separated and placed higher on the hillside. Storey County, Nevada, just southeast of Reno, needed to replace an outdated wastewater treatment plant that serves the historic communities of Virginia City and Gold Hill. The new site was on the side of a hill, presenting challenges for the design of the plant and the orientation of its processes. Also, the new plant area was entirely within a district on the National Register of Historic Places. The original plant layout called for a conventional circular clarifier, which was impossible due to the uneven terrain. The final design included a customized, modular tank arrangement for aeration and to hold sludge. The equalization tank was separated and placed higher on the hillside. The plant features a secondary clarifier and UV disinfection. Separate equalization tanks were shipped to the site first and installed in time to handle increased wastewater flow due to a popular annual festival. The new packaged wastewater treatment plant has an average daily flow of 200,000 GPD, and a maximum daily flow of 300,000 GPD. The plant occupies a smaller footprint and is more efficient than the old plant, eliminating the threat of watershed pollution during floods. The Virginia City plant is designed to provide cost-effective service for years to come.